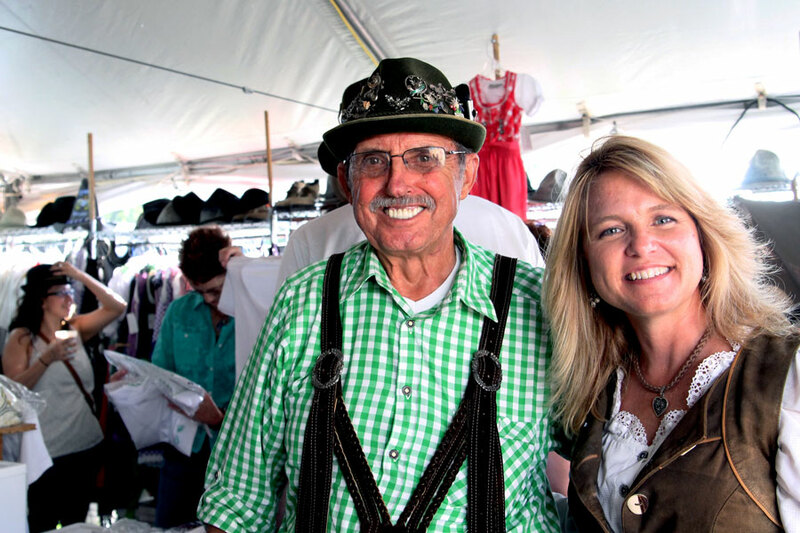 Oktoberfest in Fredericksburg celebrates German culture in Texas. Men test their strength with a beer holding contest. The man who can hold the beer out for the longest time wins. The winning time was around seven minutes. “Guten tag” greetings ring out between neighbors, though their calls are almost drowned out by the sound of tuba players nearby. The smell of sausage links and sauerkraut begins to fill the air as people walk by heavily clad in lederhosen, a traditional German costume, despite the warm day. Oktoberfest is a sensory experience that appeals to anyone, whether they know how to say “good day” in German or not. It is a Germanic tradition that is over 200 years old, but this Oktoberfest is not in Germany. With an estimated 18,000 visitors in one weekend, the line for Fredericksburg’s Oktoberfest grows rapidly. Some visitors arrive in traditional German costume. Oktoberfest visitor bites into a Reuben sandwich with sauerkraut. It is one of the many German dishes served in Fredericksburg. Volunteers at the festival prepare to refill cups at the bar taps. Floral crowns adorned the heads of many women at the festival. 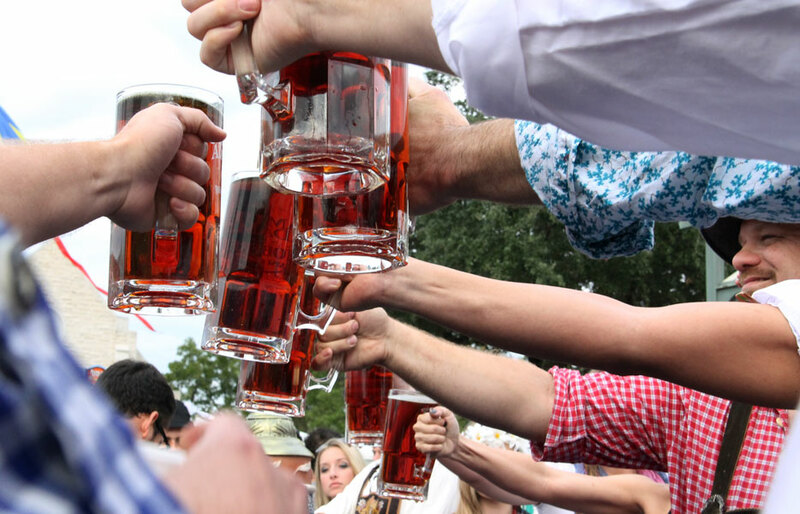 This is the 33rd annual Oktoberfest in Fredericksburg, Texas, an area known for its rich German history. Deborah Farquhar, manager at Creative Marketing – which runs the festival, has been involved with Oktoberfest for 31 years. “In 1979 a group of artists got together with some local people of interest to create a place to show their artwork,” Farquhar said. Heather Hall, a long time customer, stands by the owner of German Imports. The German costume store has been supplying traditional costume imports for several years. There is a tent at the event that is now dedicated to the local art guild, and several vendors sell a variety of handmade gifts such as traditional German costumes, handmade jewelry, pottery, quilts, and Oktoberfest mugs. Farquhar said the event is different from some other Oktoberfest celebrations in that it is a “family event” which serves the usual variety of beers, but focuses more on culture. Stages are set up all around the main area, filled throughout the day with Germanic bands that perform everything from yodeling to the chicken dance. There are food booths all around the grounds serving up sauerkraut Reubens and “Oma’s sausage links”. Rennie and the Happy Travelers performs traditional German songs. They are one of the first bands to begin bringing people to the dance floor that day. The Hermann Sons Mixed Choir serenades visitors in the morning. One of the early acts of the day, no one is on the dance floor yet. The Tuba Meisters band performs their renditions of several famous German songs. Band leader Ray Grim (far right) sings between blowing notes on the Tuba. 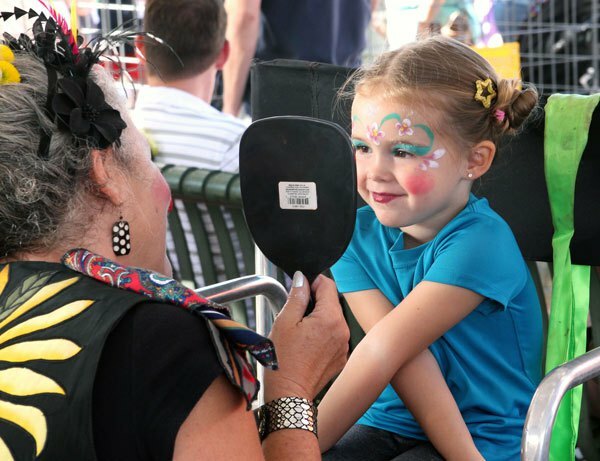 Amanda Everitt, a visitor at Oktoberfest, brought her young daughter to the event this year for the first time. Oktoberfest in Fredericksburg. Photo by Anna Daugherty. There is a large children’s area that hosts games and bounce houses, but the growing commotion is not coming from the children’s area – it is coming from a nearby crowd whose cheers make it sound like they are on a rollercoaster, going up and down, up and down. 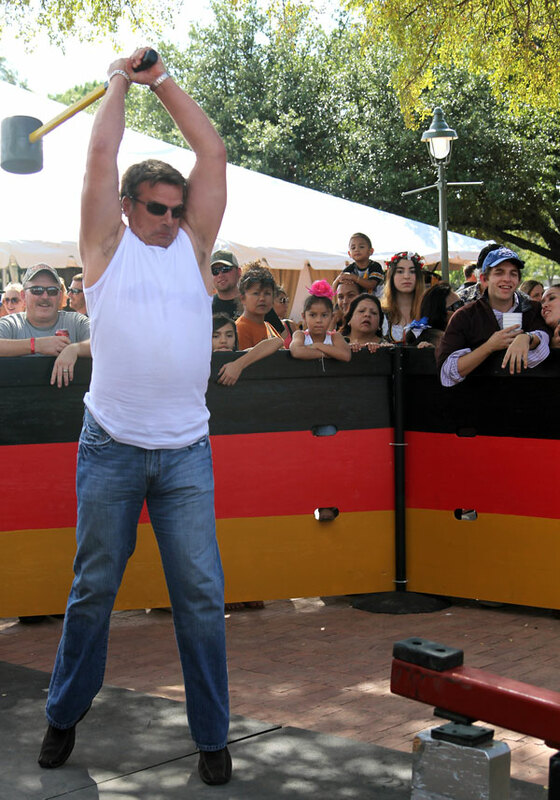 Richard Andrews puts all he has into the “High Striker”, a popular game at Oktoberfest. He is one of the few who strikes the bell and receives a ribbon. The crowd surrounds a low wooden wall, and children climb on top of it to get a better view. Inside the wall, men take turns slamming a mallet hammer on the “High Striker” with the hope that the metal shooter will ring the bell waiting at the top. Three tries and you are out, like a baseball game. The first strike often misses, and the crowd shouts encouragement. The second strike sends the shooter half-way up the row and the crowd lifts their voices, only to fall with disappointment. The third strike, for the lucky ones, sends the shooter to the top for that crisp ping of the bell, always followed by cheers. While the visitors are playing, there are others at work. Ron Kuykendall, a vendor, was busy selling his handmade pottery. This was Kuykendall’s second time to sell at the event. With an estimated 18,000 visitors to the event, Kuykendall said being involved has truly helped his business. 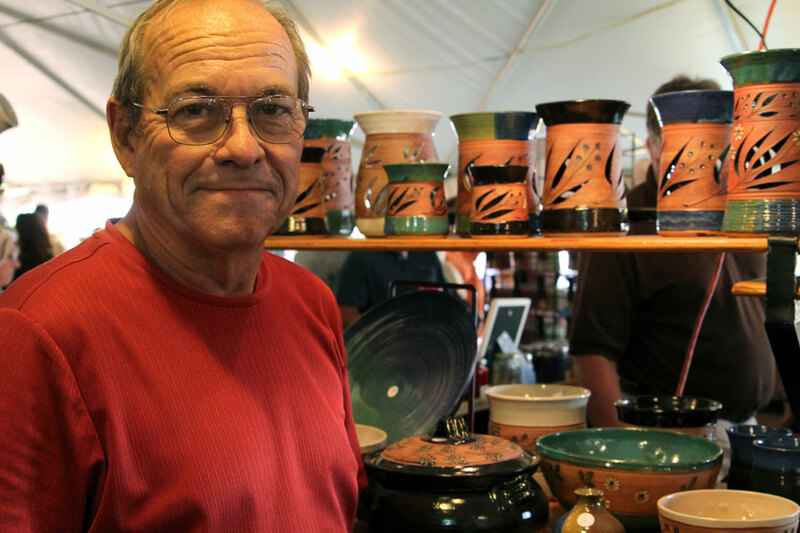 Ron Kuykendall displays his homemade pottery in the vendor’s tent. This was Kuykendall’s second year to sell at Oktoberfest. Farquhar said it is such artists who helped start the Oktoberfest celebrations in Fredericksburg 33 years ago. “They knew that this being a Germanic community with a passion for local arts made it (Oktoberfest) a win-win for everyone,” she said.